At Care Animal Hospital, our expert staff of doctors and our skilled support team are here to do just that. Under the directorship of our highly skilled veterinary doctors, your pet is always in good hands. We're ready when your pet needs us. Dr. Dustin Gilbert, Care Animal Hospital's managing veterinarian, was born and raised in Evergreen, CO. He received his bachelor's degree in biology from the University of Denver in 2007. At DU he worked in forensics, doing DNA and body fluid analysis. Dr. Gilbert graduated from Colorado State University College of Veterinary Medicine in June of 2011. He worked as in Associate Veterinarian in Omaha, NE for two years before returning to Colorado. He has worked at Care Animal Hospital since 2013. His special interests include internal medicine, small animal oncology and ultrasound. Dr. Gilbert has three dogs, Penny, a Golden Retriever mix, and Teddy, a Mastiff mix and Lily a Norwegian Elkhound. In his free time he enjoys snow skiing, hiking, barbecuing, and spending time with family and friends. 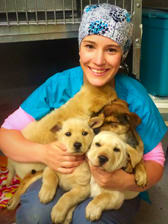 Dr. Cassie Jensen is the newest veterinarian to join the team at Care Animal Hospital. 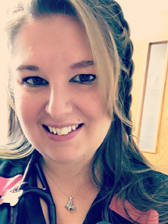 She was born and raised in North Oaks, Minnesota, but left the state to attend college at Purdue University where she received a degree in Biology. She then attended veterinary school at the University of Minnesota and graduated in May of 2016. After graduation, Dr. Jensen completed a 5 month internship in wildlife rehabilitation medicine before moving out to Colorado to start her career in general practice. In her free time, Dr. Jensen enjoys skiing, playing piano, reading, and traveling to visit friends and family. Natalie grew up in Chester, Virginia, a small-town south of Richmond. Her home was always bustling with affectionate cats and energetic dogs, for as long as she can remember. She received her Bachelor’s Degree in Ecology and Evolutionary Biology from the University of Colorado at Boulder. Following graduation, she worked as a field researcher, energy coordinator, and a veterinary assistant at local clinics and animal rescues. In 2012, she completed her Masters in Biomedical Sciences at Colorado State University. She continued her education at Purdue University College of Veterinary Medicine in West Lafayette, Indiana. While there she was involved in multiple academic and philanthropic organizations. After graduating from Purdue in 2016, she moved back to Colorado with her fiancé and goofball kitty, Milo. Milo has been a notoriously "difficult" cat at the vet, and his struggles have motivated her to work at a clinic that shares her values of low-stress feline handling. She can relate to all the cat owners that get just as stressed as their feline companions when thinking about going to the vet. Her special interests include: all things cat (low-stress feline medicine), dentistry, anesthesia/analgesia, and client education. She believes the backbone of a great veterinarian is quality client education. Outside of veterinary medicine, she LOVES the outdoors. Specifically, she enjoys backpacking, running, tubing, rafting, climbing, and crocheting. She recently went on a two-week excursion hiking the Andes in Peru. Dr. Walmsley grew up outside of Philadelphia and developed a love for animals early in life in a home full of cats, dogs, gerbils, fish, and frogs. She received her Bachelor’s degree in Biology at the University of Virginia. 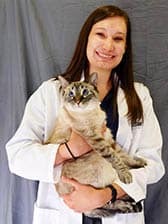 After graduating, she worked as a veterinary assistant in Pennsylvania and Maryland before receiving her Doctor of Veterinary Medicine at Tufts University. 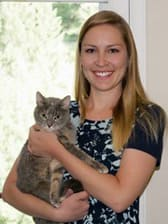 She went on to completed a small animal rotating internship at Angell Animal Medical Center in Boston before moving out to Colorado with her cat, Meera. When Dr. Walmsley isn’t treating her patients, she loves hiking, running, skiing, cooking, and spending time with family. Dr. Gorden graduated from Colorado State University with her DVM in 2013. Since then, she has been practicing mixed animal medicine on the plains of Colorado, treating a variety of animals, but specializing in small animals and alpacas. Prior to attending veterinary school, Dr. Gorden was a registered nurse. Her background practicing human medicine has given her a special bond working with both her human clients and animal patients. When Dr. Gorden isn’t treating her patients, she can be found wandering through museums, reading history books and historical fiction, baking cookies (requests are welcome! ), hiking with her dog, and volunteering. 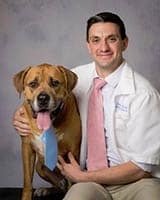 Dr. Gorden is owned by an amazing Golden Retriever, named Hamilton, and an ancient scruffy rescued cat, Lewis. Dr. Gorden is a fan of anything glittery or sparkly. Dr. Gorden is excited to join Care Animal Hopsital, and she looks forward to bringing her experience and compassion to each visit and creating lasting relationships with both her clients and patients.